Beautiful vintage European armchairs. Untouched and in original condition. They have a wooden frame accented with uniquely colorful upholstery. Bound to make a statement in any space. Boho chic rattan chair from the 1950s. In great condition! Reupholstered in denim fabric. In great condition! Thonet bentwood bistro armchair featuring dark brown antique cane bottom. Midcentury Danish armchair with orange/yellow upholstery. Renaissance style armchair from the Catalan region of Spain. Constructed from richly stained oak and leather, accented with wonderful nailheads. 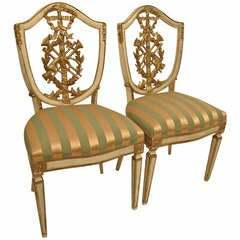 A pair of hand carved, painted and gilt wood pair of side chairs. Recently upholstered. Original paint and horse hair batting. Italy, early 19th century. 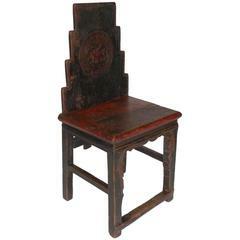 Early 19th century, all original Chinese chair with original red paint, and dragon and leaf carvings. Nice worn patina throughout. A fine pair of 19th century solid mahogany Scandinavian Empire Klismos chairs, circa 1820. Good condition with wear and tear consistent with age and use. 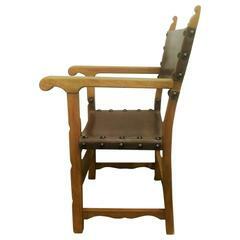 A wonderful 19th century American side chair with complex bent and curved back stiles, a woven splint seat, and the most perfect patina. The seat is very strong. 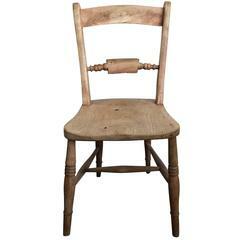 19th century French side chair.